Leapfrogging Our Way to HDTV…. On Monday DirecTV announced that by the end of the year they would be carrying 130 national HD channels and would also be offering 1080p HD moves by the end of the year. This morning Dish Network played a game of leapfrog with DirecTV by announcing that by the end of the year they will have 150 HD channels and in addition they will be offering customers full 1080p movies in August…. Dish Network will beat DirecTV to the 1080p race by offering their customers the movies “I am Legend” in 1080 and I am told the quality will be comparable to Blu-ray. Dish Network surprised me by announcing all of it’s MPEG4 HD DVR’s would be upgraded (or “Turbo Charged”) via a software download in August to be able to display 1080p. I personally thought that in order to see these resolutions a customer would need a new receiver such as the upcoming Dish Network 722k MPEG4 HD DVR that will be available to customers later this year. This surprise announcement shows me how well thought out the Dish Network receivers really are, as I never expected them to be able to support 1080p resolutions. In addition, the direct-broadcast satellite operator is debuting TurboHD, three all-HD programming packages. The three TurboHD tiers are: Bronze ($24.99/month for more than 40 channels), Silver ($32.99/month for more than 50 channels) and Gold ($39.99/month for more than 55 HD channels). Dish said it has the capacity to offer up to 150 HD channels with the July 16 launch of its Echo XI satellite, which Rocco blogged about here. DISH is calling their rapid move to 1080p "the biggest HD upgrade in history," which follows DirecTV’s assertion just days ago that they remain the leader in delivering HD. When the war of words and rhetoric heats up between the two biggest satellite TV providers in the US, you know that will be good news for consumers. Clay T. Whitehead passed away last week. Former director of Nixon’s Office of Telecommunications Policy, he was largely responsible for completely changing the commercial satcom business the U.S. and Europe. RCA, Hughes, PanAmSat and SES et. al. owe their success to his vision and work. Clay T. "Tom" Whitehead, 69, who helped the cable industry flourish by bringing competition to the domestic satellite market in the early 1970s, died July 23 at Georgetown University Hospital. He had prostate cancer. During the Nixon administration, Mr. Whitehead became the country’s first telecommunications policy adviser and championed free markets in the satellite business. He later revolutionized the way communications satellites were sold — outright to cable providers instead of leasing them to those companies. Starting in the mid-1980s, he challenged Europe’s state-owned television systems by spearheading the first private Pan-European television satellite system, Luxembourg-based SES Astra. 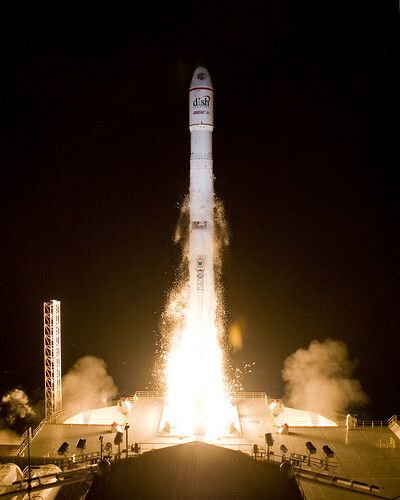 It became one of the continent’s most popular and profitable private satellite systems. Dr. Whitehead had degrees in engineering and management but little knowledge of communications when in 1970 he was appointed the first director of the old White House Office of Telecommunications Policy. Considered bright and able, he said his chief concern was trying to get the federal government to become "more anticipatory" in addressing rapid technological changes. During his four years overseeing the office, he sough to demolish the monopoly model that had given tremendous power to large international corporations such as Comsat and Intelsat. He set in motion policies that allowed domestic satellite competitors to succeed, and far more cheaply. His work had an enormous impact on the cable industry, which because of his efforts could get its own programming channels via satellites to a national audience. Before, that reach was impossible unless a cable channel wanted to lease land lines from the monopoly provider AT&T. HBO, the Turner cable networks and C-Span were among the key beneficiaries of Dr. Whitehead’s decisions. Henry Geller, a Washington telecommunications lawyer and Federal Communications Commission general counsel, said Dr. Whitehead "changed the entire landscape of television in the United States and throughout the world" by advocating an "open skies" policy toward domestic satellites. Geller said Dr. Whitehead "stopped the FCC cold, which was still promoting Comsat as a domestic monopoly. Satellite service became more competitive, allowing such companies as RCA and Hughes to achieve greater innovations more cheaply." Dr. Whitehead was credited with formulating policies that gave more autonomy to local stations in the public broadcasting system, which was seen by some PBS executives as an attack on the service in large part because of Dr. Whitehead’s early reputation for antagonizing the press. He called network television news a haven for "ideological plugola" and "elitist gossip." His criticisms extended to the public broadcasting system, which he called a "fourth network" for alleged liberal biases. He apologized before a Senate committee, saying his own comments "did not serve a very useful purpose." Clay Thomas Whitehead, was born Nov. 13, 1938, in Neodesha, Kan., and raised in Columbus, Kan.
An early interest in astronomy led him to the Massachusetts Institute of Technology, where he received a bachelor’s degree in electrical engineering in 1960 and doctorate in management in 1967. He was a Rand Corp. economist before joining the Nixon team in 1968 as an expert on budget policies. He also helped create the Office Telecommunications Policy, which was folded into the Commerce Department’s National Telecommunications and Information Administration during the Carter administration. 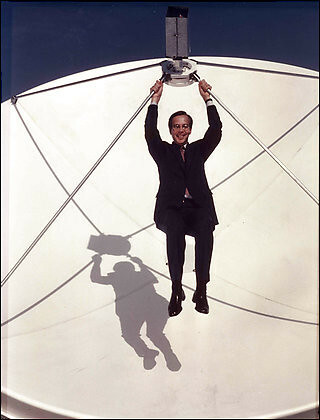 In 1979, Dr. Whitehead became the founding president of Los Angeles-based Hughes Communications, a satellite-manufacturing subsidiary of Hughes Aircraft Co. His greatest achievement was the Galaxy program of commercial communications satellites, which addressed the needs of a rapidly growing cable television market. He likened the Galaxy program to a mall with an "anchor tenant," such as HBO. Each subsequent company would buy a piece of the satellite. This approach made enormous profits for Hughes, reportedly $200 million for the 24 transponders on the Galaxy I that launched in 1983. "I suppose the thing I like to do most is set things up and make them run," Dr. Whitehead had once told the New York Times. He left Hughes in 1983 because he said he tired of working for a big company. He spent the next two years laying the financial, technical and political groundwork for a $180 million enterprise that became SES Astra. Some European politicians criticized the proposed system as "Coca-Cola satellite" and dismissed it as cultural imperialism, all to protect their government-run television channels. "I think we’re seeing wounded national pride," Dr. Whitehead told Forbes magazine in 1985. "There would be more European programming if a large commercial marketplace already existed there." SES Astra, in which Luxembourg is a major stakeholder, grew tremendously. Its programming is beamed into more than 65 million homes, and its worth was estimated to be more than $1 billion. 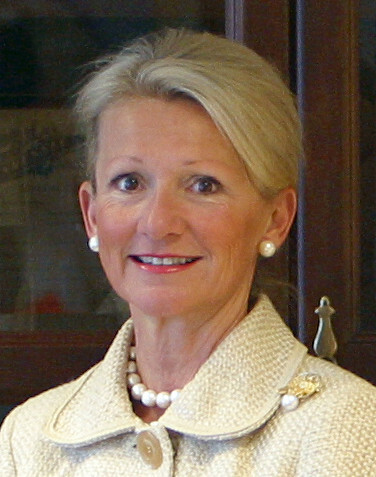 A contractual dispute led Dr. Whitehead to sue SES Astra and the Luxembourg government for $600 million. He was consumed by the lawsuit for a decade, until prevailing in 2003. The final agreement was confidential. Unfortunately he spent some 10 years of his life in a legal squabble with SES Astra (and the Luxembourg government) claiming a total of $1.8bn and receiving some €30m as dividend payments in a Court-ordered settlement in June 2002. At year end 2007, 117.2 million homes receive audiovisual broadcast and broadband services via ASTRA at 19.2º, 23.5°, 28.2º East or SIRIUS at 5.0º East. The ASTRA Group** consolidated its position as the top European satellite fleet for DTH reception. 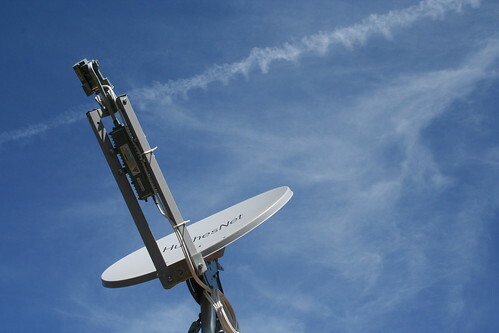 By end of 2007, 50.3 million homes receive ASTRA or SIRIUS services directly via satellite. A further 66.9 million homes receive services via ASTRA Group satellites in cable. More than 4 out of 10 of all TV homes within the ASTRA Group footprint are now receiving digital services. Satellite continues to be the most popular digital reception mode, with a 58% share of the total digital market. 81% of all ASTRA satellite homes are digital. superior signal coverage and 130 channels of unbeatable programming. Our aggressive growth strategy is delivering improved financial performance and we are committed to providing the best service possible to our subscribers." XM Canada has an exclusive Canadian license from U.S.-based XM Satellite Radio. Meanwhile, the Canadian satellite operators are expanding. First, the upstart Ciel recently announced that Industry Canada has issued them "Approvals in Principle" to develop the following spectrum: Ka FSS at 91°W and 109.2°W; 17 GHz BSS at 91°W, 103°W and 107.3°W; and 12 GHz BSS at 138°W. Second, Telesat has issued a "call for interest" from broadcast, enterprise and government customers who might wish to jump on board Telesat’s recent acquisition of six satellite approvals-in-principle for development of BSS and FSS frequencies from Industry Canada. Is the rapid expansion of orbital locations to the north too much? Time will tell. DirecTV and DISH Network, for example, are in need of more bandwidth for HDTV expansion. 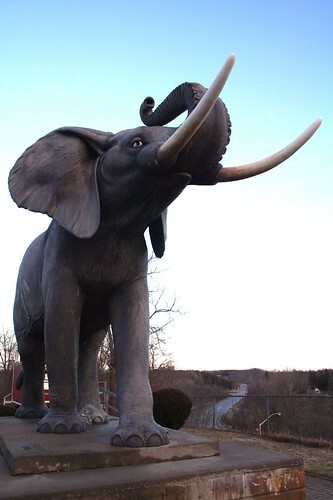 Whoever "bags an elephant" as big as those companies will surely find their investments paying off. The last time it happened, many scientists say, it killed off 70 per cent of all life on the planet and wiped out the dinosaurs. But the next time some city-sized chunk of rock comes shooting through space toward the Earth, a team of scientists led by a Canadian intend to find out in time to stop it. A one-of-a-kind, $12-million satellite mission to be launched by the Canadian Space Agency in 2010 will track at least some of the tens of thousands of large asteroids within striking distance of Earth. The satellite, called the Near Earth Object Surveillance Satellite (NEOSSat), will give researchers a whole new view of space. Instead of looking for asteroids with large telescopes in observatories, researchers will get to see the skies from the point of view of the satellite — 24-7 data from areas not normally visible from earthbound telescopes. The satellite, designed to be more controllable than the Hubble Space Telescope, will be able to twist and move in space, giving researchers an unprecedented range of view while tracking moving bodies. The spacecraft that may end up saving all of life on earth is being built by Ontario-based Dynacon. HughesNet and WildBlue now are positioned for a head-to-head contest for leadership of the U.S. satellite broadband market, say researchers at Northern Sky Research. Hughes has long held the title of leader in terms of subscriber base, reportedly with more than 400,000 clients, but WildBlue’s rate of growth to date has been faster than Hughes, NSR says. WildBlue had 300,000 consumer broadband subscribers at the end of 2007 and is said to be growing faster than Hughes. Leading observers predict that market share will be nearly 50-50 by the end of 2008. NSR researchers note, however, that the HughesNet Home Plan has a nominal upper download speed of 1 Mbps compared to 512 Kbps for WildBlue’s offering. Comparing higher speed plans, HughesNet’s services on the Spaceway-3 satellite now either meet or beat WildBlue’s offers, NSR says. For more on the battle, check out the almost-always-informative forums at dslreports. And, in other HughesNet/WildBlue news, WildBlue recently announced a deal that gives WildBlue customers a deal on new Dell computers. Longtime DIY Friday fans may remember that we’ve provided plans for an at-home weather station before. So are we repeating ourselves? Running out of ideas? Not really. The previous DIY Friday weather project was pretty sophisticated, relying on a satellite tracker, antenna, and PC-controlled receiver to deliver the forecast to you. The series inspired us to track down some good family-friendly DIY weather projects. After all, it’s almost August — time to make some memories (not to mention barometers) with the kids before they get back into school. There are two places we recommend starting. Making instruments for a weather station is a great rainy day activity. Weather is on the mind of any kid trapped indoors on a summer day: A rain gauge can be put to immediate use and a barometer is best set up when air pressure is low. To hold everyone’s interest over the long run, you and your kids can set up a weather station and update it each day for a couple of weeks or you can visit the station when big weather happenings are in store…. A basic station starts with a wind vane, barometer, rain gauge, and a maximum/minimum thermometer. If you want a deluxe weather station you can add an anemometer to measure wind speed, a nephoscope to track cloud movement, and a psychrometer to measure relative humidity (directions are in most kids’ weather books). All of the devices can be built with simple household tools and easily-acquired materials; the barometer, for example, requires a clear, straight-neck glass bottle, a clear glass jar, some food coloring, and a rubber band. In other words, even the clumsiest mom and dad can lead their brilliant kids through this project. Or vice versa, as the case often is. Also check out Franklin’s Forecast for another family-friendly guide to building your weather station. So check the forecast, find a rainy day, get your tools and materials together — and enjoy a day with the kids. We predict that you’ll have fun. Here’s a question. When a major natural disaster strikes — for example, in Myanmar (Burma) earlier this year — how does the world figure out how many people are affected? 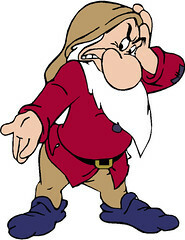 Here’s the answer: they ask SEDAC — NASA’s Socioeconomic Data and Applications Center — which works with GRUMP. No, not that GRUMP; the Global Rural-Urban Mapping Project (GRUMP) provides estimates of the population of the world and population densities, which are then overlayed with other scientific data to provide detailed maps of everything from ecosystem assessments to — wait for it — the global poultry density. “The gridded population product we produce helps officials understand the density of the population in and around a disaster area,” said Robert Chen, manager of NASA’s Socioeconomic Data and Applications Center (SEDAC) and director of the Center for International Earth Science Information Network (CIESIN), part of the Earth Institute at Columbia University in New York. “The data set shows where people actually live in relationship to hazardous events…. SEDAC, a part of NASA’s Earth Observing System Data and Information System, collects, stores, processes and distributes population, land use, and socioeconomic data. A significant mission of NASA’s Earth-observing satellite program is to enable scientists and other users to conduct analyses and make decisions based on the resulting data. SEDAC advances this mission by developing and operating practical applications that merge social science and Earth science data to improve knowledge of how humans interact with Earth’s environment. The dataset produced by GRUMP is fascinating. Think you live in a crowded area? Take a look at India and China. SEDAC has also produced an amazing series of maps showing the "human footprint" on the world, which can be viewed here. Also be sure to check out CIESIN’s maps showing the global distribution of vulnerability to climate change. Republican commissioner Deborah Taylor Tate is the only FCC member left to vote on the deal and she is expected to do so shortly, two FCC officials close to the negotiations said. She is expected to sign off on the deal in exchange for a consent decree that resolves several enforcement issues involving the satellite radio companies and a combined fine of about $20 million, an FCC source close to the deal said. Ms. Tate has also asked for a variety of other minor conditions, an FCC source said. An adviser to Ms. Tate did not respond to a call for comment. Exact details about the deal are not known since FCC officials and lawyers for the companies appear to still be working them out. Ms. Tate’s vote would finally end the agency’s 13-month review of the deal. Her vote is critical for the deal’s approval since the rest of the five-member board remained evenly split on the deal. As of Wednesday morning, both of the FCC’s two Democratic commissioners had voted against the deal. Democrat Jonathan Adelstein announced his decision in a statement, noting he was hoping for a "bipartisan solution" but that the other commissioners weren’t interested. Last week, Mr. Adelstein proposed conditions including a six-year price cap, a 25% channel set-aside for non-commercial and minority-owned stations and interoperable radios that would receive high-definition signals from terrestrial radio stations. FCC chairman Kevin Martin had made it clear to the rest of the commissioners Tuesday evening that Mr. Adelstein’s conditions would not be a focus of the negotiations, an agency source said. In recent days, Ms. Tate has been the center of negotiations, as the companies have wrangled over how to resolve several outstanding enforcement issues that have been raised. They include issues involving complaints that some of the satellite radio receivers exceeded FCC power limits and bled into the signals of some local radio stations. Concerns have also been raised that Sirius has yet to bring to market an interoperable radio despite an FCC requirement that it develop one. Broadcasters have also complained that satellite booster towers were placed in nonapproved locations. Yes, that’s the title from a memorable 1966 movie, a comedy. That’s also the title of an Agence France-Presse bulletin issued earlier today that begins with "The Russian are coming…"
The Guiana Space Centre (CSG) is girding for a new era when it will host Russian rockets and Russian engineers who just a short while ago were Europe’s space rivals. For 40 years, this base on the coast of French Guiana was the prestigious symbol of French, and then European, ambitions in space. On Sunday, a freighter is due to dock in Cayenne bearing a first consignment of 150 containers of equipment to fit out a launch pad at CSG where, from the second half of 2009, the first "European" Soyuz is scheduled to blast into space. Nothing funny about the space business — very serious business indeed. This might be the beginning of greater cooperation in space, especially the business side. Launching commercial spacecraft is big business, costing anywhere from $80 to $100 million or more for heavy-lift launches. Satcom operators need access to reliable launch service providers, and if they could increase capacity. 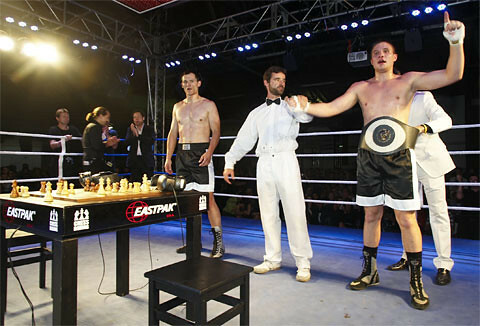 The Russians are coming — to chessboxing, too. "Chessboxing?" That’s right: it’s a new sport. Brains and brawn. Just like the rocket launch business. The 2008 Olympics in Beijing is right around the corner and, despite the political controversy, one thing is clear: this year’s games will be easier to watch than ever before. It’s all because of VOD: Video-on-Demand. NBCU is producing lots of VOD, which will be available via DIRECTV. NBCU is providing DIRECTV with 10 VOD titles each week, including athlete features, Beijing previews, and more. The service will be available through the end of the Olympics in both standard-definition and HD. 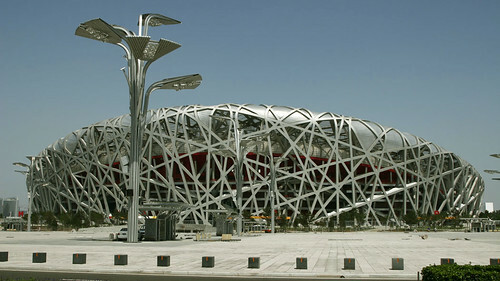 NBCU will produce more than 500 titles now through the end of the 2008 Beijing Olympic Games. The VOD offerings are just part of NBCU’s extensive coverage of the games, which will also be available on FiOS, Broadband, and Verizon’s V CAST mobile service. For those who prefer to watch online, NBCU’s website will give fans access to approximately 2,200 total hours of live streaming and video coverage of 25 different sports. The site will also feature blogs, live chat, athlete profiles and, of course, the latest results. The servers and platform for the groundbreaking digital content will be provided by Sun Microsystems. If you want to psych yourself up for some amazing sports action in Beijing, search YouTube for some great moments in Olympics history. Take, for example, the 1968 Olympics in Mexico City where Bob Beamon set a new world record in the long jump that stood for 23 years. On reading that title, you might be asking yourself “why in the world would I need to predict space weather?” Well, I’ll tell you. Space weather – the range of high-energy radiation, such as X-rays and gamma rays, that constantly bombard the Earth’s atmosphere – affects the performance of some of your favorite gadgets, like GPS and satellite TV. With this camera, scientists can predict changes is space weather, allowing for communications companies to compensate for electromagnetic interruptions to their signals. Never again will your Planet of the Apes marathon be spoiled by a bad signal. Oh, and it’ll help the military predict and plan for interruptions in their communications too. The project – the Global-Scale Observations of the Limb and Disk – is known by a catchy acronym: GOLD. The GOLD Camera will fly on an SES AMERICOM satellite. Physicist Richard Eastes, who leads the GOLD project, says this is the first time that a NASA instrument has flown on a commercial communications satellite. This is the second “hosted” payload for an AMERICOM spacecraft just this month. The other was for the Air Force’s CHIRP (Commercially Hosted Infrared Payload).